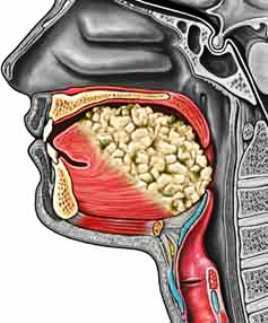 Tongue cancer is treated in our Head and Neck Cancer Program within the Upstate Cancer Center. Tongue cancer is a subgroup of head and neck cancer. Cancer develops from the squamous cells of the tongue, forming a localized tumor. Cancer cells have the potential to grow and spread. Tongue cancer is often grouped with other mouth cancers, such as cancer of the lips, hard palate, cheek lining, the portion of the mouth underneath the front of the tongue, or gums. These cancers are collectively known as oral cancer. Cancer occurs when cells in the body divide without control or order. Eventually these uncontrolled cells form a growth or tumor. The term cancer refers to malignant growths. These growths can invade nearby tissues including the lymph nodes. Cancer that has invaded the lymph nodes can then spread to other parts of the body. Tongue cancer may be detected by your dentist during a routine dental cleaning, or by your doctor during a routine physical exam. To confirm diagnosis, your doctor will ask about your symptoms and medical history. A physical exam will be done. This may include examining your tongue for lumps or masses. A fiberoptic scope may be used. Your tongue tissue may need to be tested. This can be done with biopsy . Tongue cancer treatment depends on the stage of the cancer, and the size and location of the tumor. This is surgical removal of the cancerous tumor and nearby tissue, and possibly nearby lymph nodes. This is often the preferred treatment when the tumor is on the visible side of the tongue, when it is less than 2 centimeters, and when it is on one side and does not involve the base of the tongue. This is the use of radiation to kill cancer cells and shrink tumors. Radiation therapy is used when the cancer is at the back of the tongue. Chemotherapy is sometimes used with radiation to destroy the cancerous growth, especially if surgery is not planned. Do not smoke or use tobacco products. If you do smoke or use tobacco products, talk to your doctor about how you can quit . Drink alcohol in moderation. Moderate drinking is a maximum of 2 drinks per day for men and a maximum of 1 drink per day for women. See your doctor regularly for check-ups and cancer screening exams.